Among biblical theologians, Graeme Goldsworthy is a well-respected scholar with great passion for Christ and his church. His works on the Bible, the kingdom of God, hermeneutics, and preaching are treasures that help us see Christ in all Scripture. [This is the most recent “Feeding on the Word” article for our church newsletter]. In most Bibles, Luke’s second book is entitled, “The Acts of the Apostles.” However, as many commentators have noted, a more accurate title would be “The Acts of the Holy Spirit” because it is the Spirit who is responsible for convicting, converting, and creating the church. Yet, even this title is insufficient, because it tempts us to think that the Father and Son are absent. Thus, a better title might be, “The Acts of the Triune God Through the Church of Jesus Christ.” While lengthy, such a title rightly emphasizes God’s work in and through the early church. With this trinitarian framework in mind, lets consider how the Father, Son, and Holy Spirit work together in Acts to convert sinners and create the church. In six biblically-saturated, clearly-articulated chapters, Southern Seminary professor Bruce Ware develops an historical, biblical, and practical look at one of the church’ most mystifying doctrines–the doctrine of the Trinity. Father, Son, and Holy Spirit is densely packed with biblical data, but clearly outlined to help provided an accessible grip on the uniqueness of each member of the Godhead. Written at a popular level, Ware argues for unity and diversity, harmony and distinction, authority and submission between the Father, the Son, and the Holy Spirit. He follows the Western understanding of the relationship; God is one substance, in three persons; the Father sends the Son, and the Father and the Son (i.e. filioque) send the Spirit. Ware uncovers the biblical data for these doctrines, but the strength of the book is its attention to application and the direct relationship that the Trinity must have in the church, the home, and in gender relations–hence, the subtitle, Relationships, Roles, & Relevance. On the Father: Marvel at the wisdom, goodness, care, and thoroughness of God’s authority; marvel at the perfection of his fatherhood; marvel at the wisdom of his divine delegation; marvel at his unsurpassing supremacy and glory; and look for ways to emulate and incorporate these fatherly traits. In a world that despises and undermines authority, show gracious servant leadership that sacrifices yourself for those you are responsible to lead or oversee. On the Son: Marvel at the submission of the Son to the Father for all eternity; marvel at the submission to the Spirit while on the earth; marvel at the relational love between Father and Son. Personally, I sense this last application whenever I watch, hold, and care for my son. What a gift that God would let us know the kind of Father-Son intimacy in our own families. On the Holy Spirit: Be instructed by the Spirit’s humble willingness to participate in the Trinity virtually unnoticed without recognition or overt honor; ponder the willingness of the Spirit to assume authority over the son for a season and then to gladly relinquish that authority when Christ ascended to the right hand of the Father. Most Christians will never be known, their names never documented by a biography or publicized for their great achievements. They will be simple people who live lives depending on Jesus life, death, and resurrection. In this, they are leading exemplary Spirit-filled lives. I look forward to meeting those men and women. I want to be one of them. 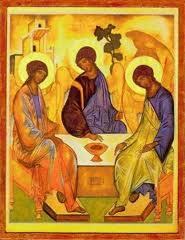 On the Trinitarian Community: Human relationships model the Triune relationship; the relationality of the Trinity calls for the creation of genuine Spirit-wrought community; the Trinity demonstrate equality in essence and eternal authority-submission that neither demeans nor devalues. In this, America’s egalitarian church needs to be corrected. It is wrong thinking to assert leadership and authority equals value. Children are under their parents authority, but they have the same worth before God. The authority-submission structure of the Trinity must overrule our culturally-determined proclivities. Resultantly, husbands and wives must learn from the Trinity how to lead with love and submit with gladhearted respect, and churches must take God at his Word that men are to lead in the church and women are not to teach or have authority over men (cf. 1 Cor 11:4-6; 2 Tim. 2:12-15). This is not a social construct. This is a Trinitarian directive. In short, Bruce Ware’s book is a great introduction to the Trinity, especially for those who want to see how “Theology Proper” and “speculative” theology impacts our daily lives. Father, Son, and Holy Spirit shows how the doctrine of the Trinity has everyday relevance and import. May we marvel at God the Father, God the Son, and God the Holy Spirit, and may our minds and lives be transformed accordingly.